NEW ORLEANS (AP) Blake Griffin and his Clippers teammates figured they deserved the unpleasant critique from coach Doc Rivers at halftime. So they took it to heart and completed the franchise’s greatest road comeback in more than a decade. 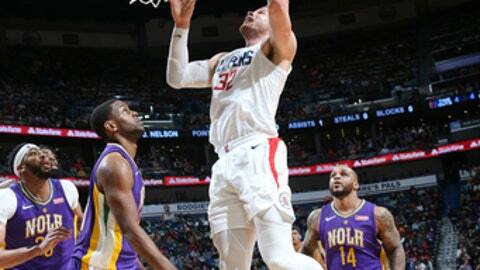 Griffin had 27 points and 12 rebounds, capped by his crushing 3-pointer with 43 seconds left, and Los Angeles beat New Orleans 112-103 on Sunday in the Pelicans’ first game since a season-ending injury to All-Star center DeMarcus Cousins. Lou Williams added 22 points, DeAndre Jordan had 12 points and 19 rebounds, and Tyrone Wallace scored 19 points for the Clippers, who erased a 21-point, first-half deficit and snapped New Orleans’ four-game winning streak. It was the largest comeback of the season for the Clippers – and the largest road comeback since 2004, when they were coached by Mike Dunleavy, who is now a college coach in New Orleans with Tulane. Anthony Davis had 25 points and 17 rebounds for the Pelicans. New Orleans had won seven of eight coming in, but was playing for the first time all season without Cousins, who averaged 25.2 points and 12.9 rebounds before tearing his Achilles tendon in the final seconds of a victory over Houston on Friday night. Davis had a scary moment late in Sunday’s game when he tried to beat Jordan off the dribble. He slipped near the edge of the paint and went down with his legs splayed. He remained in the game, but kept trying to stretch out his groin. Having played more than 40 minutes, including the entire second half, Davis received prolonged treatment after the game and did not speak with media, but there was no indication from team officials that he would miss New Orleans’ next game. His slip resulted in a turnover with the Pelicans trailing 105-102, and Griffin then sank his decisive 3 on Los Angeles’ next possession. Jrue Holiday scored 20 points and E’Twaun Moore 18 for the Pelicans, who led 62-51 at halftime but fell behind for good when they were outscored by 14 points in the third quarter. The Clippers took their first lead when Williams hit a 20-foot jumper and left-wing 3 in succession to make it 72-70 late in the third period. The Pelicans briefly regained a 75-74 lead on Jameer Nelson’s 3 before falling behind for good on Griffin’s layup as he was fouled. Without Cousins, New Orleans relied more on a smaller lineup and attempted 35 3s, but hit only nine. The Pelicans also made only 2 of 19 3s attempted in the second half. Clippers: Williams has scored at least 20 points in each of his past 12 games in a reserve role. … Clippers reserves other than Williams combined to score 12 points. … Teodosic scored 12 points. Pelicans: Davis’ rebound total gave him a franchise all-time high of 3,857, eclipsing David West’s mark of 3,853. … The Pelicans tied their largest lost lead of the season, having also lost to Golden State on Dec. 4 after leading by 21. … Asik, who was averaging 7.4 minutes per game, played eight minutes in Cousins’ absence and had four points and three rebounds. New Orleans scored the first eight points of the game, starting with Davis’ alley-oop dunk, and led the entire first half. Despite Davis scoring only six points in the first 24 minutes, the Pelicans opened up a 56-35 lead on a 3 by Dante Cunningham, who started in Cousins’ absence. Ian Clark and Darius Miller each hit 3s, Clark added a layup and reserve center Omer Asik scored twice inside during a 20-7 Pelicans run in the second quarter. The Clippers closed the gap with a 16-6 spurt that began with Williams’ 3, included Jordan’s dunk of Griffin’s alley-oop lob and ended with Griffin’s 3. Clippers: Host Portland on Tuesday night. Pelicans: Host Sacramento on Tuesday night.